June is National Aphasia Awareness month, but there is also another special holiday for an application developer in June. Tactus Therapy Solutions is celebrating their first birthday as a company and in honor of this, they have given 25 codes to 25 different websites to give away their Comprehension TherAppy app! You're looking at one of the 25 websites right now! I was also given a copy of the application to review, so let's take it away to the review and giveaway (giveaway is at the very bottom of the post)! When the application is first opened, a clean, easy to read screen is shown with three different options as well as settings and information. This screen is easy to read, laid out with space inbetween buttons, not overwhelming with a background, and has large buttons which makes this great for those who have difficulties with vision. Tapping the "i" icon will bring you to the information page. Here, you not only will see instructions and settings details for the app, but also Tactus Therapy's website, social media links, an e-mail newsletter link, a link to other applications by Tactus Therapy Solutions, the company e-mail for support/feedback, and a disclaimer stating that this product is a therapy tool to be used under guidance of a speech-language pathologist. As a speech-language pathologist, I appreciate seeing this disclaimer on the application because there are people who think if they get an application for AAC or therapy and use it themselves without the guidance of a licensed therapist, it will be a miracle worker. 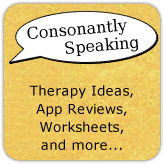 Speech-language pathologists and other therapists are trained to know how to use tools (apps or other) to facilitate recovery of a communication disorder in regards to whether or not the tool is appropriate for the client, the settings appropriate, the level of communication, the vocabulary to begin with, the steps to recovery, and more. The main page also has links to social media by pressing the "Connect" text and to other Tactus Therapy Solutions applications in the app store by pressing the "Other Apps" text. Tactus Therapy Solutions has a demo of their application on YouTube which is not listed on the application itself. In addition, Barbara Fernandes (GeekSLP) also has a great demo of the application on YouTube. I have placed both of these videos below for you to view to see the application in action! English (North American), English (UK), Spanish, and French languages can be chosen from on a scroll bar. Whichever language is highlighted is the one that will be used. Choose from "Easy", "Medium", and "Hard" difficulties by pressing the associated button. The button which is highlighted in blue is the one that will be used in the application once the "Settings" menu is left. Adjusting the difficulty will change how the icons are semantically related from distant to close relationships. You can choose from "Auto", 2, 3, 4, and 6 for the field size of the icons/text presented on the application. This will choose how any vocabulary items are shown on the screen at a time for the client to choose from. Depending on how long your session is or how many trials you would like your patient to do, you can change this setting to 10, 25, 50, 100, or infinity. The great thing about this application is if you choose to stop the trials early, it will still calculate data for the number of trials completed. This way, if you notice your client becoming tired or distracted or if you need to change the settings, you will still have that data available to e-mail at the end of the session. If you have an e-mail address in which you would like the results of you clients sent to, place the e-mail in the field next to the text. Do this by clicking on the blank field and the keyboard will appear for you to type your text. Tactus Therapy Solutions recognizes that this application may not only be used for adults who have aphasia or other communication disorders, but also with children who have aphasia or a receptive language disorder. If you are using the application with a child, make sure to use the toggle-switch on/off button to turn "Child-Friendly Mode" on. This will make sure that none of the images shown are inappropriate for children or too advanced. The main page has three different options to choose from once you have your settings in place. 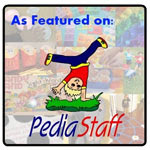 These include "Listen", "Read", or "Listen & Read" with corresponding ear and book icons on the buttons. If this type of application play is chosen, a narrator will verbally state the vocabulary to be chosen for each field presented. Icons will not have text associated with them and the vocabulary will not be presented in text form. Icons will include real-life images of vocabulary. To hear the narrator present the word again, press the "Repeat" button at the bottom of the screen. For clients of whom you would like to read the vocabulary chosen to match with the associated image, press the "Read" button. Real-life images will appear to choose from. The client must choose the image that matches the text at the bottom of the screen. The text is not read aloud. Instead of images, text is shown for each vocabulary item on the screen in a grid format. The vocabulary text in which the application wants the user to choose will be read aloud, but not shown at the bottom of the screen. 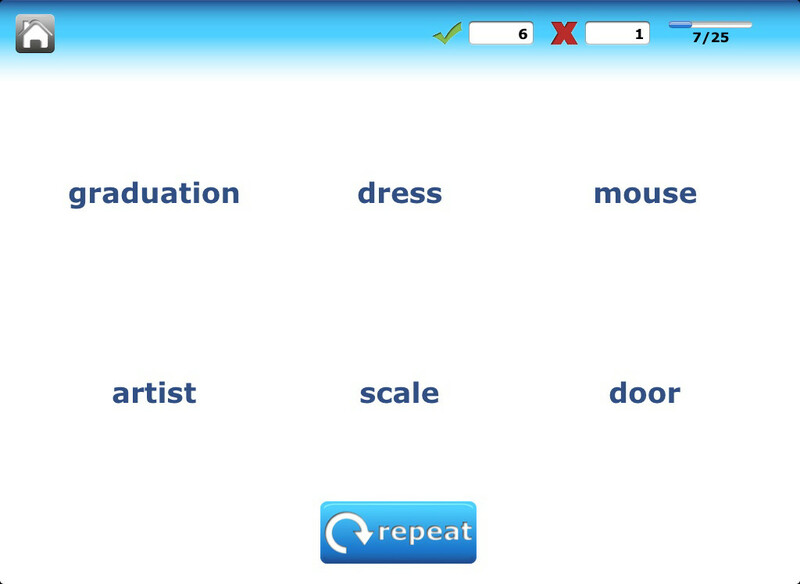 To hear the narrator read the vocabulary item again, press the "Repeat" button at the bottom of the screen. 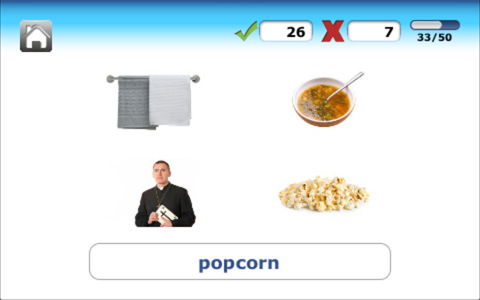 Once you have chosen they way in which you would like the patient to practice, you will be brought to the next screen to choose the category of vocabulary you would like to focus on. These subcategories allow you to choose from a specific area to focus on if your client is working on specific vocabulary. 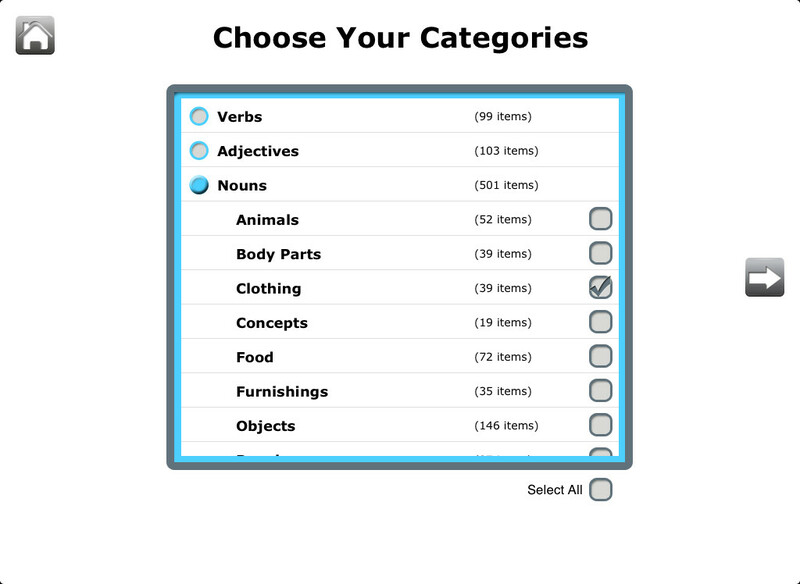 You can select which vocabulary to work on in the "Nouns" category by pressing the check boxes next to the subcategories you wish to choose. If you do not have a preference and would like to have all of the nouns worked on, press "Select All" at the bottom of the screen and all of the check boxes will be checked. If you wish to choose which subcategories to focus on, press "Deselect All" which will uncheck all of the boxes, and then you can choose the specific subcategory/ies to focus on by pressing the check box next to the given subcategory. By choosing a category or subcategory, this does not mean that you will go through every single item available. The number of trials that you would like your client to complete is chosen on the "Settings" page and also a session can be ended at any time. Also, the application chooses the items at random so each time you open the application to use it, a different grid of choices will show. Pressing the arrow button on the left hand side of the "Choose Your Categories" screen will bring you to the first trial of the application. This will look different depending on which type of settings you chosen on the main page. See specific screens for "Listen", "Read", and "Listen & Read" above as well as the variety of items shown on the grid. The number of trials completed will show at the top right hand side of the screen. This allows the user and the therapist to know which trial the client is on and how many are left. It shows not only a fraction but a bar at the top to show completion. To the left of the trial bar are the correct and incorrect trial boxes. This shows how many items a client got correct or incorrect. The number of correct trials will show in the box next to the green check mark. The number of incorrect trials will show in the box next to the red x. Clients will not only know the total number of correct/incorrect trials, but when they choose a vocabulary item to match a textual word or narrated word, a box will appear around the item chosen. This box will flash green if the item chosen was correct and red if it was incorrect. If the item chosen by the client was incorrect, they are given the opportunity to try again until they get it correct; however, trials following the first trial of a given grid will not be counted. 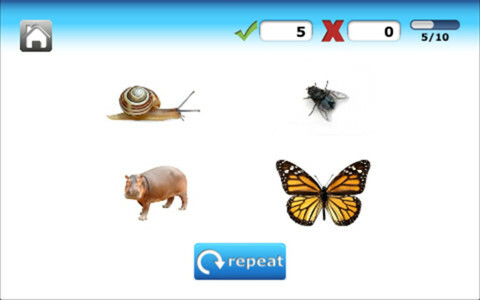 A corresponding sound will also play if correct or incorrect. Once the item chosen is correct, the next screen will be shown with a new grid to choose the correct vocabulary from. Once all of the trials are completed or if you stop the game play by pressing the "Home" button, a pop up image will appear. 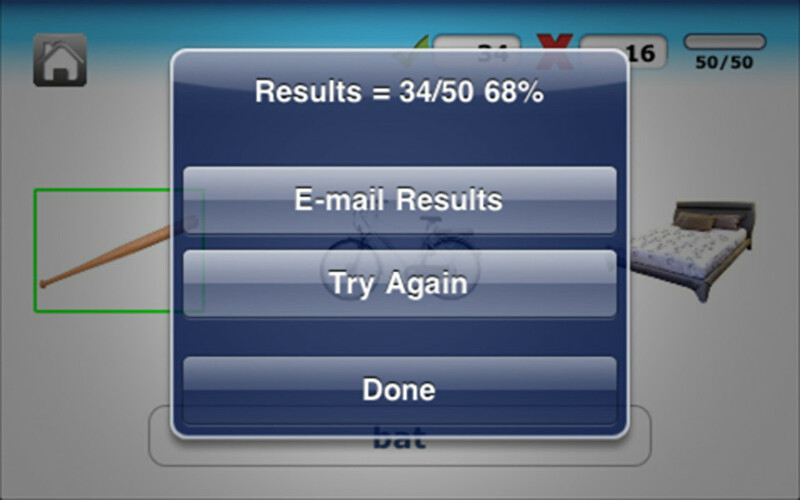 This will display the results so that you can either e-mail them via the Mail application on the iPod Touch/iPhone/iPad or have the client "Try Again". Make sure that if you choose to e-mail the results that you have your e-mail associated with the Mail app on your iPod Touch/iPhone/iPad. If you choose to e-mail the results, Comprehension TherAppy creates a paragraph for you with professional language describing the results; however, you can also type in the e-mail as well. If you wish to head back to the main menu to complete the therapy session or choose new settings, press the "Done" button. 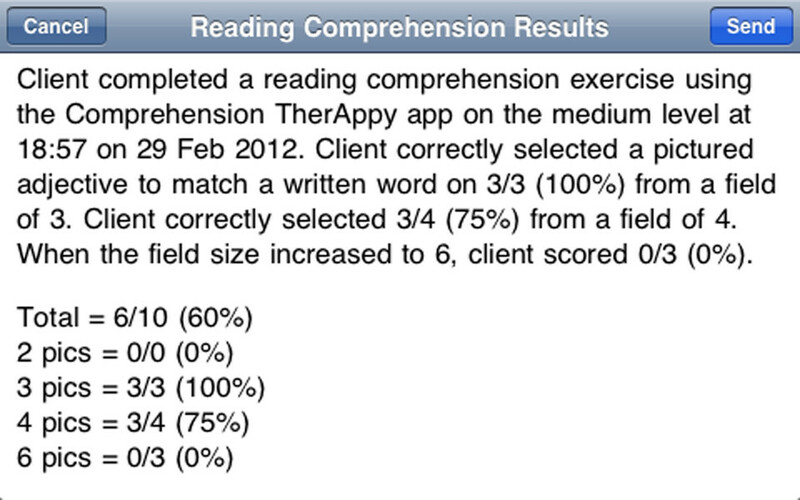 The application is clean and simple to use for clients who have aphasia. There are real-life photos, a white background, and no distracting backgrounds or audio. The ability to have user profiles on various applications to save client data has been very helpful for me to track progress within the application. I would like to see client profiles on this application as well. However, I understand due to HIPAA rules and regulations that one must be careful in keeping client data on an iPad, so maybe it would be helpful to even have a password to get into the profiles. The sounds are not distracting at all, which is great, but it is always nice to have the option to turn them on or off in the settings menu. Also, maybe a small check or x in the corner of the correct/incorrect answer chosen would be helpful due to the fact that the boxes around the correct/incorrect choices are thin so that the client can see this better. I am not sure if this would be more distracting or not though. 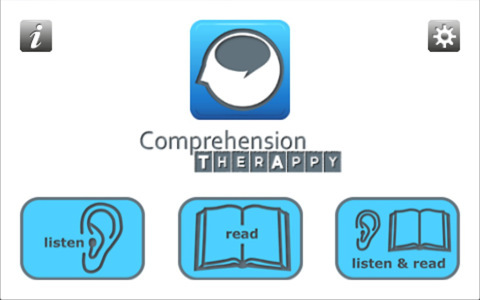 Comprehension TherAppy is available for the iPod Touch, iPhone, and iPad for $24.99. For all that you are getting in the application, I would definitely say that the price is worth it! Tactus Therapy Solutions is a great app development company for adults who have aphasia or other communication disorders, but their applications can be used with children if you are willing to take the time to tweak the settings and adapt your therapy to them. This company has recently released a new application with four of their previously created applications included called "Language TherAppy". For the price of $59.99, you will receive the following applications: "Comprehension TherAppy", "Reading TherAppy", "Writing TherAppy", and "Naming TherAppy". If you wish to trial this application or any of the previously stated applications, you can do so for free by downloading "Language TherAppy Lite". This is a great way to get all four applications for a slight discount and not have to load each individual application on your device. Three different speech-language pathology blogs that I read have also reviewed this application (and one recently too!). iSpeak App reviewed the application on its website about a year ago, and Speech Time Fun as well as Speechie Apps reviewed the application as part as Tactus Therapy Solutions' giveaway this year. Speechie Apps' giveaway for the codes is a separate blog post found here. Feel free to check out their reviews as well! 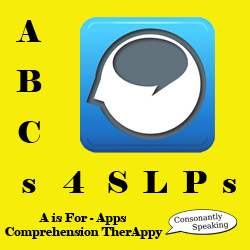 Consonantly Speaking was given a code to review the application as well as two codes to give away to readers. No other forms of compensation were given.